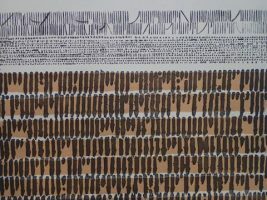 In DE DIVITIIS (Latin for “regarding riches”) Lynda Ballen continues her engagement with the natural riches yielded from earth’s surface through an exhibition of 40 drawings and a selection of prints. Ballen’s previous exhibition, Concerning Preciousness (2012), looked at metals and gems as capital. For this show, she focuses on the value of pigments derived from the soils and rocks that form the earth’s crust and recognizes these materials as precious. For all works in this exhibition, Ballen uses the trope of the landscape to depict fictional places that encourage a visual and psychological journeying. Alongside references to geological structures and to excavation, there is an invitation to traverse geographic space over land and across oceans in search of treasure. 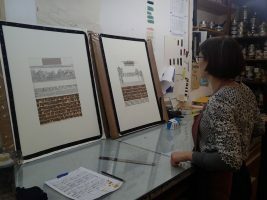 A major part of the artist’s creative process is physically making the paper on which she applies these intricate scenes. 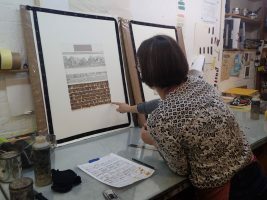 Ballen’s handcrafted paper is made from reconstituted natural fibre – tinted with raw pigment (greens, blues, browns, yellows and greys) and laminated over a matrix of thread – to support the ink drawings. This process informs her purpose to allude to the earth’s mantle. Ballen’s work is situated in response to her appreciation that textiles are historically ritual objects and serve as currency in particular cultures worldwide. Indeed, her landscapes explore age-old global expeditions for mining, the trading of pigments and the seeking of materials used for making cloth. This speaks to the various social, political, economic and spiritual associations and to the enduring technical processes of weaving and papermaking. 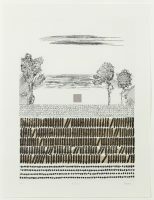 The detailed drawings deploy mark-making conventions typically used for intaglio and relief printmaking. 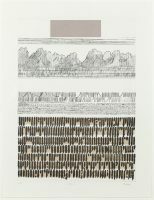 However, rather than creating multiples, Ballen’s images are applied to unique pieces of paper to emphasize the significance of the paper itself. 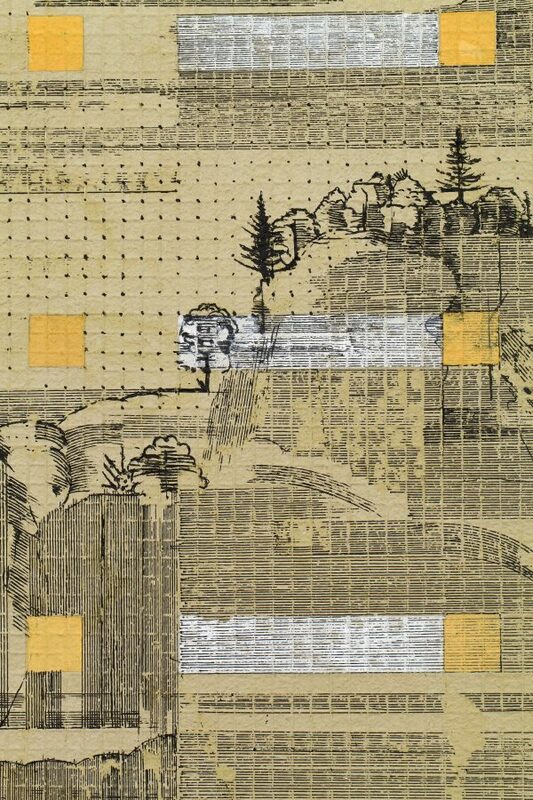 Even in her editioned prints, which feature in this show, each piece of paper is distinctive. In this new body of work, Ballen is attentive to the often overlooked fact that paint and ink are made from pigment. 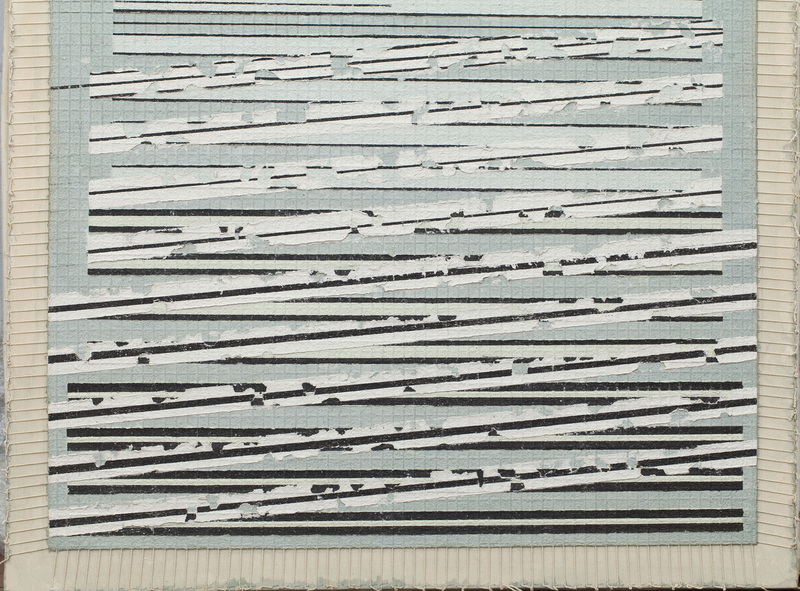 She points to this by inserting pure colour and tone in and amongst her line drawings, applying geometric shapes of colour and pattern into her grid of weft and warp to reference textile heritage. In essence, this proliferation of work seeks to highlight the very process of production, from excavating the material to making the paper to constructing the image. As the title – DE DIVITIIS – indicates, this show stakes a claim for the value of the earth itself and the riches mined from it to make materials that are all too often taken for granted. In doing so, Ballen honours craftsmanship and the harnessing of the creative imagination in artistic enterprise.